Due to a paradigm shift in lifestyles, there is growing concern that type 2 diabetes mellitus (T2DM) will reach epidemic proportions in Ghana. However, specific characteristics of the disease are under explored in this region. More challenging are those yet to be diagnosed or who complain of poor health in the absence of a diagnosed disease—suboptimal health status (SHS). We conducted a study to examine various factors that characterise SHS and T2DM. Using a cross-sectional design, we recruited 264 people as controls and 241 T2DM patients from January to June 2016. The controls were categorised into high and low SHS based on how they rated on an SHS questionnaire-25 (SHSQ-25). Anthropometric and biochemical parameters: body mass index (BMI); blood pressure (BP); fasting plasma glucose (FPG); glycated haemoglobin (HbA1c); serum lipids [(total cholesterol, triglycerides (TG), high- and low-density lipoprotein-cholesterol (HDL-c and LDL-c)] were measured. The male to female ratio for T2DM and controls were 99:142 and 98:166, respectively, whilst the mean ages were 55.89 and 51.52 years. Compared to controls, T2DM patients had higher FPG (8.96 ± 4.18 vs. 6.08 ± 1.79; p < 0.0001) and HbA1c (8.23 ± 2.09 vs. 5.45 ± 1.00; p < 0.0001). Primarily sedentary [adjusted odds ratio (aOR) = 2.97 (1.38–6.39); p = 0.034)], systolic blood pressure (SBP) (p = 0.001) and diastolic blood pressure (DBP) (p = 0.001) significantly correlated with high SHS. After adjusting for age and gender, central adiposity [aOR = 1.74 (1.06–2.83); p = 0.027)], underweight [aOR = 5.82 (1.23–27.52); p = 0.018)], high SBP [aOR = 1.86 (1.14–3.05); p = 0.012)], high DBP [aOR = 2.39 (1.40–4.07); p = 0.001)] and high TG [aOR = 2.17 (1.09–4.33); p = 0.029)] were found to be independent risk factors associated with high SHS. 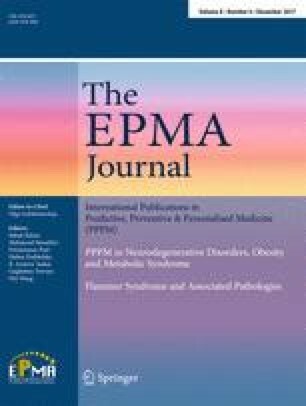 The management of T2DM in Ghana is suboptimal and undiagnosed risk factors remain prevalent. The SHSQ-25 can be translated and applied as a practical tool to screen at-risk individuals and hence prove useful for the purpose of predictive, preventive and personalised medicine. The online version of this article ( https://doi.org/10.1007/s13167-017-0119-1) contains supplementary material, which is available to authorized users. The authors wish to thank the laboratory personnel at the Department of Biochemistry at Komfo Anokye Teaching Hospital (KATH) for allowing the use of their automated chemistry analyser. Additionally, we thank the staff and research assistants at the Diabetes Centre, KATH. We also appreciate the support of staff from the Department of Molecular Medicine, School of Medical Sciences, Kwame Nkrumah University of Science and Technology. This study is partly supported by a grant from Australian National Health and Medical Research Council and the National Natural Science Foundation of China (NHMRC APP1112767-NSFC 81561128020). EA is supported by Edith Cowan University under an International Postgraduate Research Scholarship. WHO. Global report on diabetes. World Health Organisation, http://apps.who.int/iris/bitstream/10665/204871/1/9789241565257eng.pdf. Accessed 11 Oct 2016.
International Diabets Federation. IDF diabetes atlas. http://www.diabetesatlas.org/resources/2015-atlas.html, Accessed 10 April 2016.